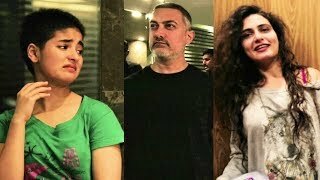 Behind the scenes of Dangal featuring Aamir Khan, Sakshi Tanwar, Fatima Sana Shaikh, Sanya Malhotra, Zaira Wasim, Suhani Bhatnagar, Ritwik Sahore, Aparshakti Khurana, cast and crew. Dangal is a 2016 Indian Hindi-language biographical sports drama film, directed by Nitesh Tiwari and produced by Aamir Khan, under his studio Aamir Khan Productions with UTV Motion Pictures and Walt Disney Pictures India. The film is loosely based on the Phogat family, telling the story of Mahavir Singh Phogat, an amateur wrestler, who trains his daughters Geeta Phogat and Babita Kumari to become Indias first world-class female wrestlers.6 Aamir Khan stars as Mahavir Singh Phogat, while Fatima Sana Shaikh and Sanya Malhotra portray the adult versions of the two Phogat sisters, Zaira Wasim and Suhani Bhatnagar their younger versions, Sakshi Tanwar their mother, and Aparshakti Khurana their cousin. Music by Pritam.